MAXAL® aluminum products have been consolidated under the Hobart® brand. Don’t worry – only the name is changing! All aluminum products will continue to be manufactured to the same high quality standards in Traverse City, Michigan, but the consolidation offers the advantage of increased product availability, along with technical support and expertise from an industry-recognized brand: Hobart. 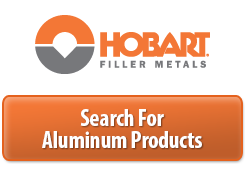 As with all Hobart products, the aluminum filler metals will continue to be developed with performance and collaboration in mind. You can continue to expect products that improve your weld quality, increase productivity and reduce costs, no matter your welding challenges. And, the Hobart filler metal team will be here to help you every step of the way.